At the time, I was on a Fulbright scholarship, with the intention of transcribing my host family’s history - I’d lived with them on a high school study abroad program - and embedding it within the socio-cultural landscape of China’s last century. However, as I interviewed Baba, I realized his family’s story, while interesting, was just one story within a wider context and I wanted to expand these stories into a fictional universe. Building upon the existing framework of our relationship - an American woman lives with a Chinese family who shares with her their story - I began work on the first draft of Empire of Glass, an epic novel chronicling the seismic changes in China over the last half century through the lens of an American who lived with them. I hoped Empire of Glass would illuminate the possibilities in cross-cultural connection, but also the complications, even violence, inherent in these relationships. I thought a lot about ownership of stories. When I collected the stories that formed the original basis for the novel, Baba relayed some stories his relatives told him. It was clear to me he could retell these stories however he deemed appropriate, colored by his own perspective. This made me think about how family stories are passed down, but also how we translate a story by way of its writing and re-telling, and how we in turn insert our own expectations and desires in this act. China in the 1990s felt on the verge of a major transformation and I wanted to be able to stand witness to that, as well as study the socio-cultural and historical basis for the changes I was seeing first-hand. Then again, even today, a lot of Western media coverage continues to present China as a power-hungry, materially-focused culture full of cutthroat individuals looking to get rich quick. I, however, made deep and lasting relationships with individuals nothing like this - empathetic, generous souls fighting against political threats to free speech, environmental protection, and individual rights. I was aware of being a non-Chinese writer writing about China. I recognized my limitations in this and attempted to fill knowledge gaps with deep research as well as several years of formal interviews with friends and family in China. My book’s frame as a translation of a given text specifically points out this disjuncture between my ethnicity, and my subject - by presenting my novel as a translation, I hoped to display not only my personal discomfort with sitting on this boundary between native Chinese speaker, and visiting author, but also the fact there is a legacy of imperialism which influenced the process of writing Empire of Glass. I was lucky to develop such a deep, lasting relationship with my family in China but also had become deeply embroiled in their history and I wanted to understand the possibilities, as well as the complications, in this unlikely relationship. 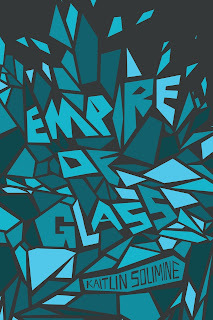 Details: Empire of Glass is published by Ig Publishing, in paperback, priced in local currencies.